Neuroendocrine tumors, or NETs, often develop into cancer. If left untreated, they can result in serious illness and death. Unfortunately, diagnosing NETs is difficult. Delays in getting a diagnosis and treating NETs can impair a person's ability to fight neuroendocrine cancers. 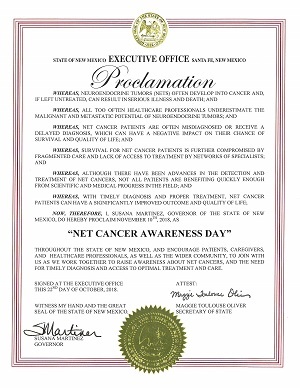 Governor Susana Martinez has proclaimed Saturday, November 10, 2018, as NET Cancer Awareness Day to encourage patients, caregivers, and healthcare professionals to raise awareness for these kinds of cancers and to help people get a timely diagnosis and treatment.